Lydia Pinkham lived a million lives, and her career as a medicinal entrepreneur didn’t even start until she was 56. 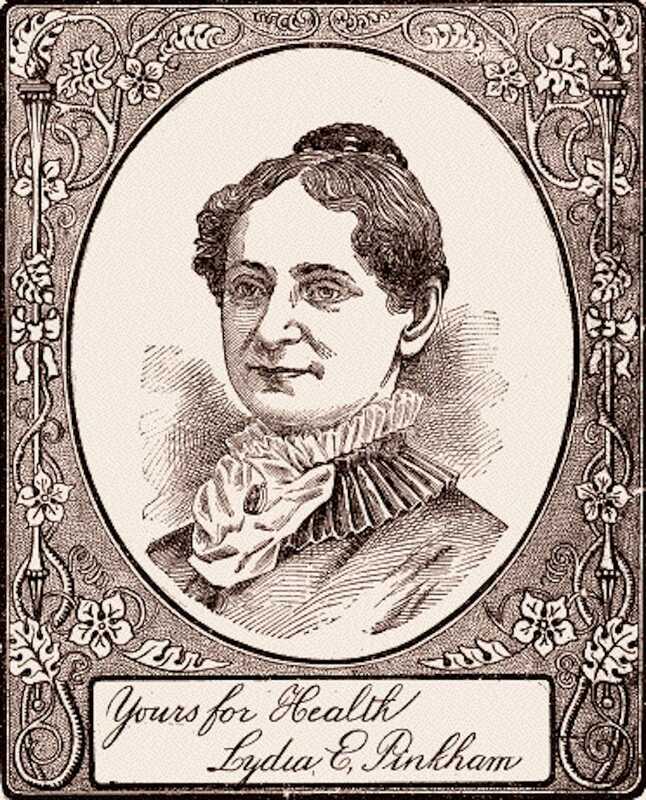 Her special juice for soothing a jumpy uterus was well-known by local women in her hometown of Lynn, MA, and in 1875 she decided to try pushing her “Vegetable Compound” on the public. Cara Giaimo over at Atlas Obscura wrote a long essay about Pinkham’s contributions, not only to over-the-counter medicine, but to the history of women selling their image as part of the package. Her alcohol-stewed herbs did put cramps to bed, but Pinkham also had an excellent marketing team pushing the hell out of her product to make it a success. Her sons Will and Dan, printed Lydia’s advice to customers and their grateful testimonials as pamphlets, and distributed them as flyers and in newspaper ads. In 1879, they commissioned a portrait of Lydia and made it the new centerpiece of the company’s brand. ...The Pinkhams leaned hard on their new tactic, shipping giant lithographs of Lydia to drugstore owners and printing small ones on collectible cards, which they attached to advertisements. Soon, their founder’s face was gazing out from jar labels, newspapers, and the windows of well-trafficked streets. According to Sammy R. Danna’s Lydia Pinkham: The Face That Launched a Thousand Ads, the picture was painted on walls and posterboarded on fences, and even infiltrated people’s homes. One newspaper reported that the company sent “large, mounted portraits of Mrs. Pinkham” to “various lady correspondents.” “Soon, many household walls were adorned by the familiar, motherly face of the Massachusetts woman who had done so much for all women,” the article read. If it is necessary that you should parade your portrait in every country paper in the United States can’t you in mercy to the nation have a new one taken once in a while? Do your hair a little differently say – have a different turn to your head & look solemn. Anything to get rid of that cast iron smile! You ought to feel solemn any way that your face pervades the mind of the nation like a nightmare & that you have become a bug bear to innocent children. Also that portrait is destroying the circulation of the newspapers. I have stopped my county paper to get rid of it & I know of several flourishing papers that have been absolutely killed by it. I think my words express the heartfelt desire of a long suffering people & that I am sustained in this request by the strongest public sentiment ever brought to bear on any subject! She actually looks more skeptical there.